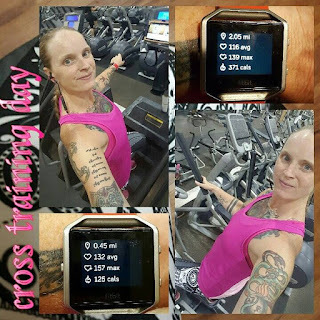 • Saturday: strictly cross training this day. 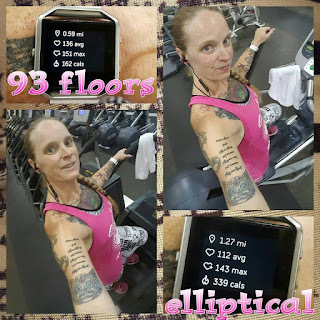 I did 50 floors on the stairclimber and 65 minutes on the elliptical. 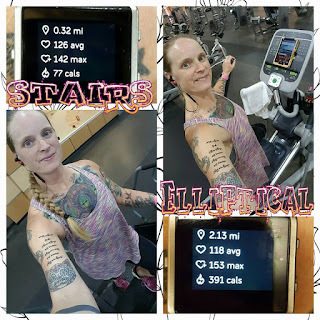 I want to start upping the amount of floors I do on the stairclimber each week by 10 floors. 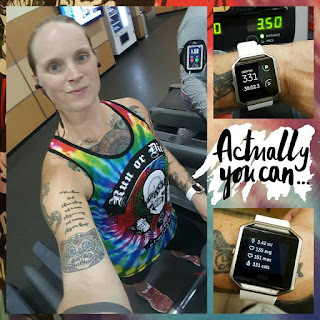 • Sunday: LONG RUN DAY! Also, NIGHT RUN DAY! 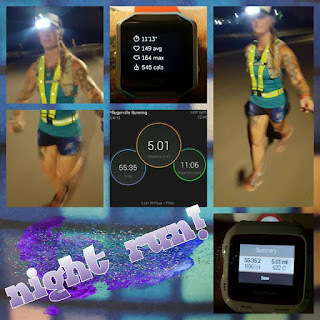 Yep, I ran my 8.4 mile long run (hey, I’m technically in taper mode for my night time trail half marathon tonight) after dark. I had just received a “vest” that was reflective and has LED lights on it for high visibility at night. The lights have a static state, a rapid flash and a slow flash. I am very happy with this belt except that it’s not meant to be worn over the top of a hydration pack so it kept riding up a little and I had to adjust it by pulling it back down to my waist. The run went quite well and I felt great the whole run. Hit 8 Pokestops and hatched 2 eggs while I was out and about too. • Monday: was originally planning on running to the gym, working out, running home. Change of plans. 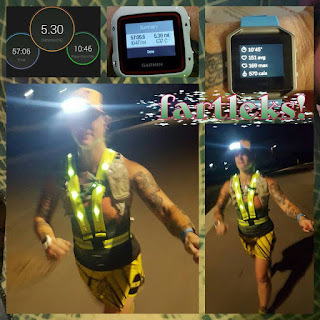 Decided I needed to do speedwork instead and set out for intervals but didn’t do something right with my new Garmin and ended up doing fartleks instead. Just as fun and just as effective. Also hatched another 2 eggs in Pokémon Go. YAY! • Tuesday: strictly gym cardio this day. 13 minutes on the stairclimber for a total of 60 floors, then 65 minutes on the elliptical. • Wednesday: did me a 5 mile run, just an out-and-back route, nothing special. 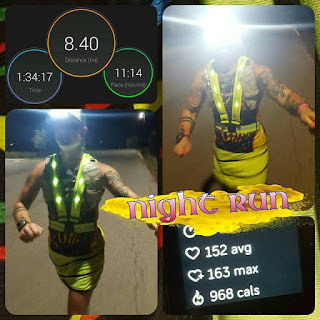 • Thursday: 3.5 mile tready run. Ran easy for most of it, then hit the gas the last bit. I think I got the pace down to 9:00 min/mi at the very end. 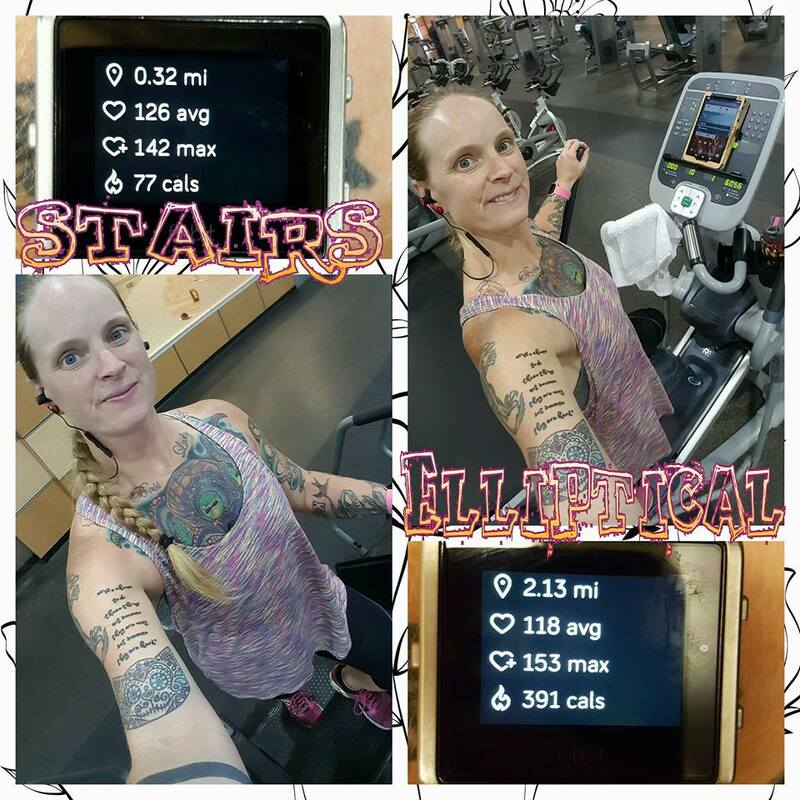 • Friday: 20 minutes on the stair climber for 93 floors, then 65 on the elliptical. Then I walked around the shopping center for about 40 minutes trying to hit 15K steps before midnight. HA! As you may recall, last Saturday was the tail end of TOM and now everything is back to normal. I’m back in the mid-150’s so all is well. 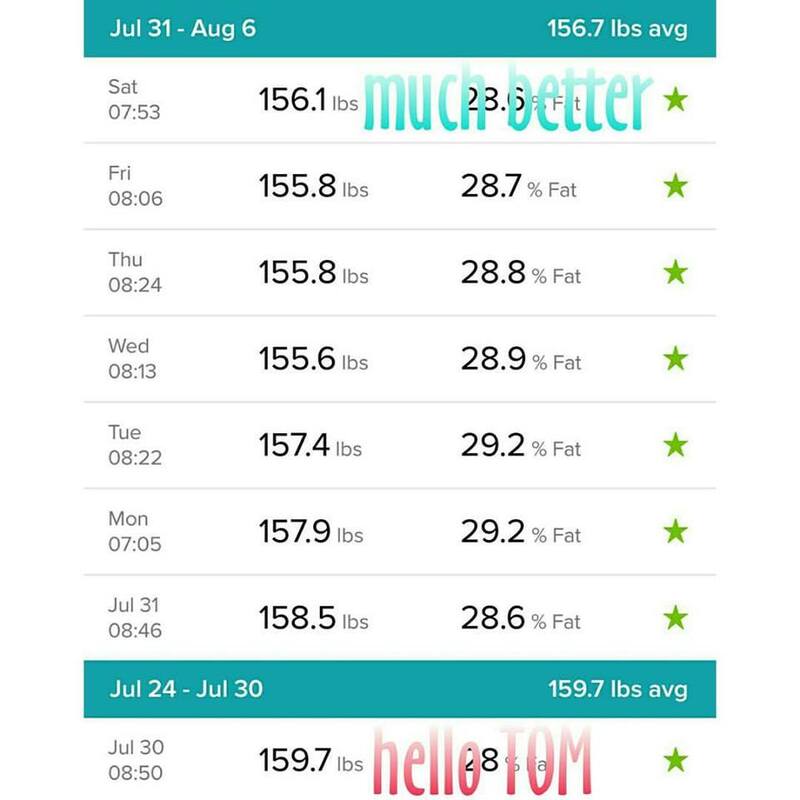 I have decided, I may as well tell you and make it “official,” but I’ve decided that I want to try and get down to 145. I think this meshes with my body fat % goal after talking to a friend of mine who is a workout fanatic (he’s more into building big muscles, though) about my body fat goal and he’s the one that said that would probably put me around 145. So, now it’s out there. If I don’t get to it, I’ll be totally okay with it. 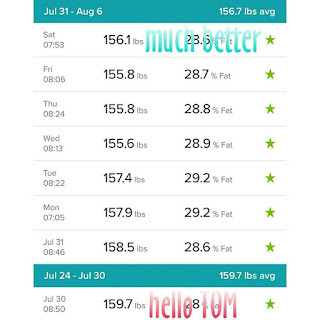 155-ish is a good weight too.